Youre on your own making decisions, says Bill Keeley about responding to emergencies on Kootenai County waters. This career doesnt work well for people who are wishy-washy. Lake and river rescues require Lt. Bill Keeley, 46, to throw himself into miserable situations. 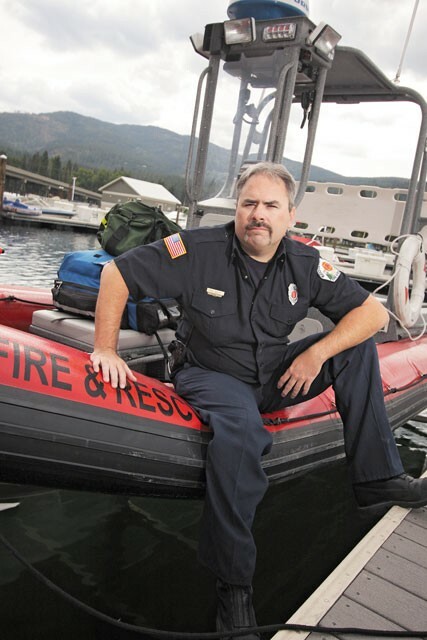 When an emergency call sends him rushing to one of the two Kootenai County Fire and Rescue boats, he wears a heavy fire-resistant uniform and life jacket, no matter the weather. “We arrive, and people are injured and freaking out in the water. We jump in … wearing uniforms, long pants and T-shirts,” he says. The rescuers try to remember to remove their shoes, radios, cell phones and wallets beforehand. Some of Keeley’s most difficult situations have been boat and personal watercraft accidents not far from shore. Keeley focuses on the injured, administering first aid, while relying on a colleague to handle the boat. Even if the lake or river is calm on a warm summer day, a boat rescue is a formidable task. And that’s just what’s going on in the rescue boat. “People in other boats do stupid things. We have lights and sirens on our boat like an ambulance, but people don’t realize that if you pass a fireboat with a patient on it, the waves you make passing it make my job 20 times harder. The patient is moving, and anything I’m trying to do, like start an IV, is now incredibly difficult,” Keeley says. Add a storm or wind with high waves, and sometimes Keeley may only be able to put oxygen on his patient, explain what’s going on and try to reassure him or her. “I’m not a doctor. I don’t have an x-ray machine or CAT scan. I can treat your immediate needs. I can talk to you and figure out where the problems are, and comfort you,” he says. Making quick decisions about treatment is key in extreme conditions. Keeley says it’s part of why he loves his job. He finds it rewarding to help people in trouble and to get a chaotic situation under control. For him, being a paramedic has been a lifelong dream, ever since he was watching Emergency! on TV when he was 7 years old. Keeley began his career with the Kootenai Country Fire & Rescue as a volunteer firefighter and worked his way up to take charge of the Emergency Medical Services division last summer. Although he has administrative duties now, he continues to go out on calls. In a typical summer month, his department will go on three to five boat rescues. The rest of the year they respond to another five to 10 emergency calls on the water. In addition, Kootenai Country Fire & Rescue transports sick and injured people by boat when it’s a faster option than a ground ambulance. Married for 24 years with two children, Keeley says his own encounters with loved ones’ health issues have given him insight and compassion in his work. “When my wife was seriously ill, I learned a lot about being on the other side of the call. I learned what it’s like to not get information. I make a point now to stop and talk to families — at least give them an idea of what’s going on,” he says. In spite of the extreme circumstances under which he meets people, Keeley feels a connection to his patients. Sometimes he gets cards or phone calls from the people he’s helped. Don’t drink while boating or operating personal watercraft. “Ninety percent of the trauma calls on Lake Coeur d’Alene are a result of alcohol,” says Lt. Bill Keeley, Kootenai County Fire & Rescue.